The Palace of the Grand Master, once the epicenter of life for the knights who lived on the island. I’m standing in front of an enormous oriental vase. It shows an elaborately detailed scene of what appears to be an empress with her attendants. If you took it down from its pedestal, it’s still a good meter or so tall. As its gold accents catch the light of the room, I find myself wondering how this old vase made its way here from the Far East in the bounty of the knights of Rhodes hundreds of years ago almost entirely undamaged when I can’t seem to get a set of glasses home unbroken from the supermarket? This vase is one of many housed in the Palace of the Grand Master in Rhodes, the epicenter of the island’s medieval connection. Walking around the palace, you’d be forgiven for thinking you were somewhere in northern Europe and not on a sunny island in the Mediterranean. 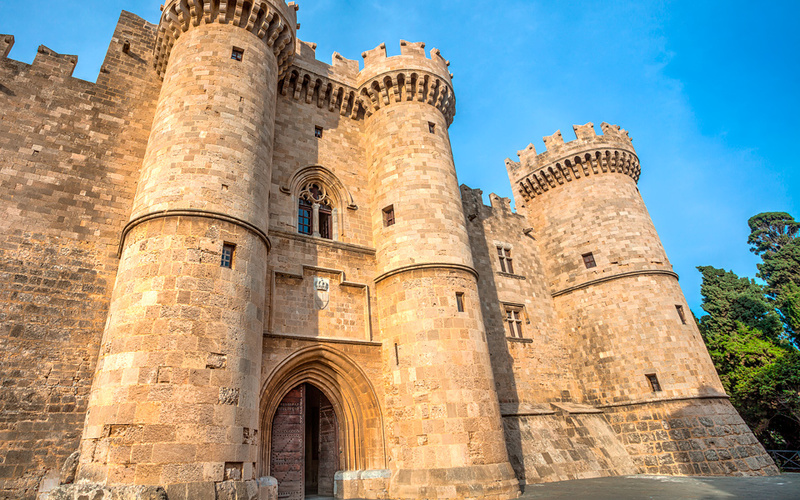 Rhodes has had a colorful history, and the knights that once called this island home have left an indelible mark. The story of the knights that came to live here begins in the 11th century, when a religious military order was founded in Jerusalem. 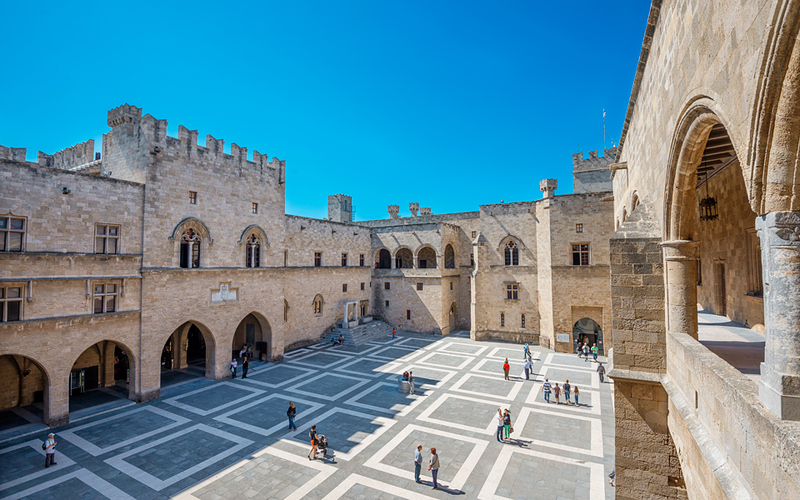 Originally known as the Hospitallers, the order was made up of a celibate brotherhood of knights who served under a Grand Master elected for life. Incidentally, the order which the knights belonged to still exists today, Grand Master and all, meaning that there is a select group of people in this world who get to put “Knight” down as their occupation on their census forms. After the fall of Jerusalem in 1291, the Hospitallers moved to Cyprus before conquering Rhodes in 1309 as their own temporal domain. The plan was a brilliant one, except for one small problem. Rhodes lay directly in the sights of countless pirates and pillagers. For two centuries, the Knights fought them off, until the arrival of fabulously named Süleyman the Magnificent in 1522, who brought 100,000 men for a showdown with the island’s 7,000 knights and men in arms. After a six-month siege, the surviving knights retreated to Sicily. They left behind remarkable traces of their time on the island, the most impressive being the Palace of the Grand Master. 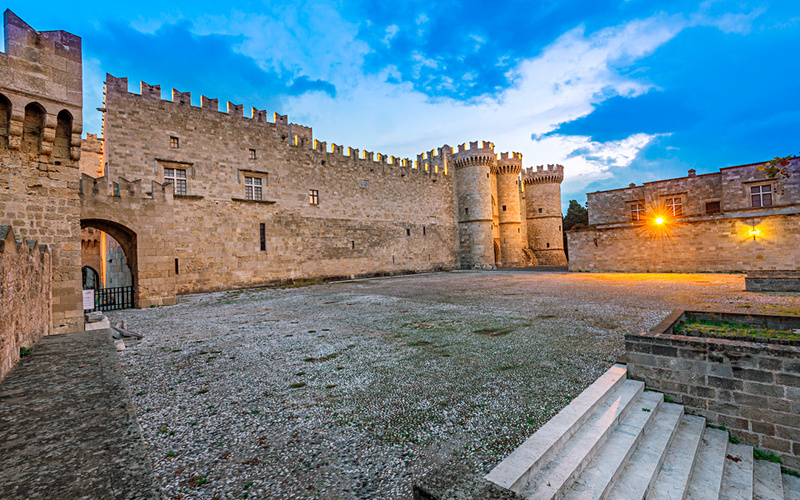 Originally a 7th century Byzantine citadel, the palace is an exceptional example of gothic architecture. After the island fell to Ottoman rule, it was used as a command center and fortress. Italian architect Vittorio Mesturino restored the palace between 1937 and 1940 and gave it much of its current appearance. 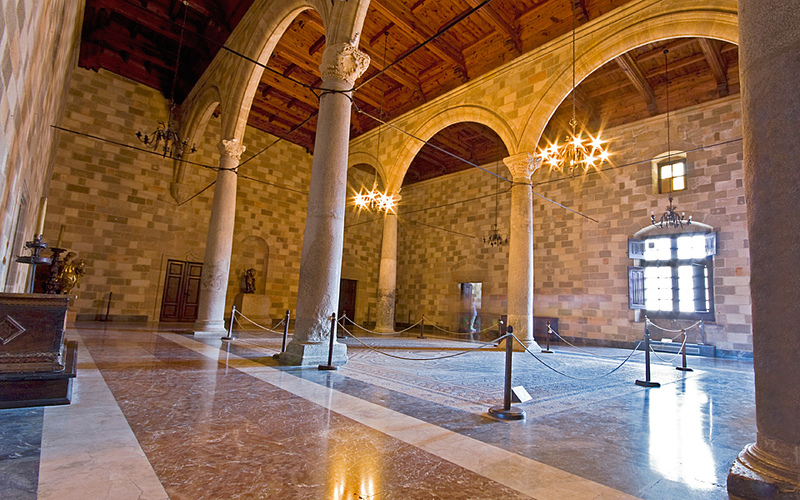 When Rhodes was unified with Greece in 1947, the palace was turned into a museum by the Greek government. 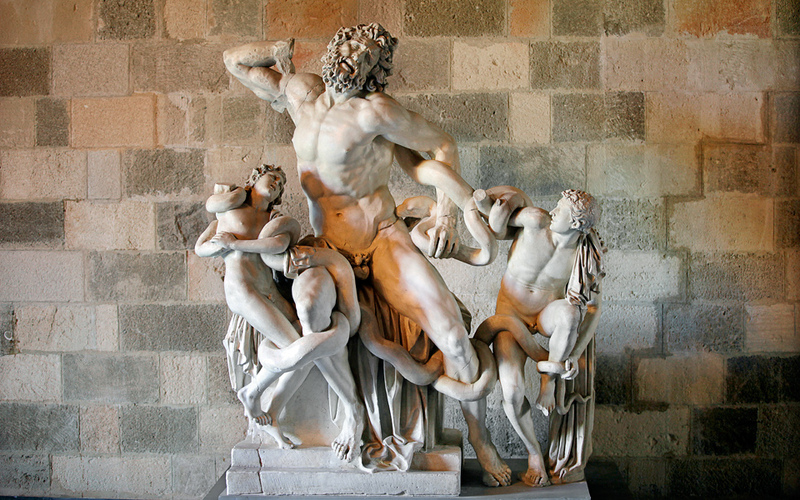 Visitors enter through a large arched doorway that leads out into an enormous courtyard where statues from the Greek and Roman period stand. But it’s the smaller details that make the palace stand out. 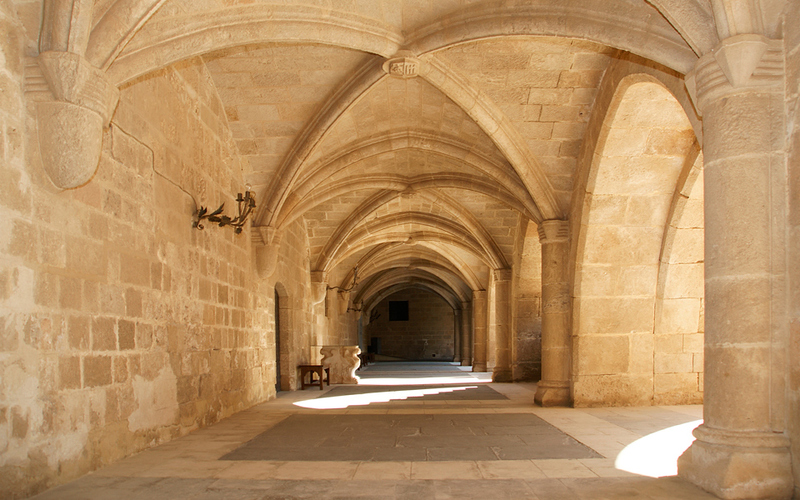 As you enter the palace itself, you are faced with a huge stone stairway. To its immediate right is a room with windows with thin sheets of alabaster instead of glass. An unearthly warm glow fills the room, simultaneously showcasing the swirling colors of the alabaster as something to admire in their own right. Walking up the staircase gives you the sense that you’re walking into a children’s fairytale book. There is a monk-like sparseness to the staircase, which contrasts with the lavish interiors that lie beyond. Over 150 rooms make up the palace, and just a handful are open to the public. These contain beautiful carved seats, mosaics, wall hangings, faded hand-woven textiles from medieval times and, of course, the numerous oriental vases that immediately stand out because they look so out of place. It’s these items in particular that made me wonder about the knights and their lives, and how these delicate objects came to their current resting place. Were they traded for some other goods? Did the knights receive them as gifts? Or did the Grand Master have a penchant for interior decorating with oriental vases? Back outside among the palm trees and the sunshine, the palace’s imposing presence only serves to enhance its otherworldly atmosphere. Life can’t have been easy while fighting off a constant stream of marauders, but a palace like this seems like a fine perk of the job. Tickets: Full EUR 6, Reduced EUR 4. 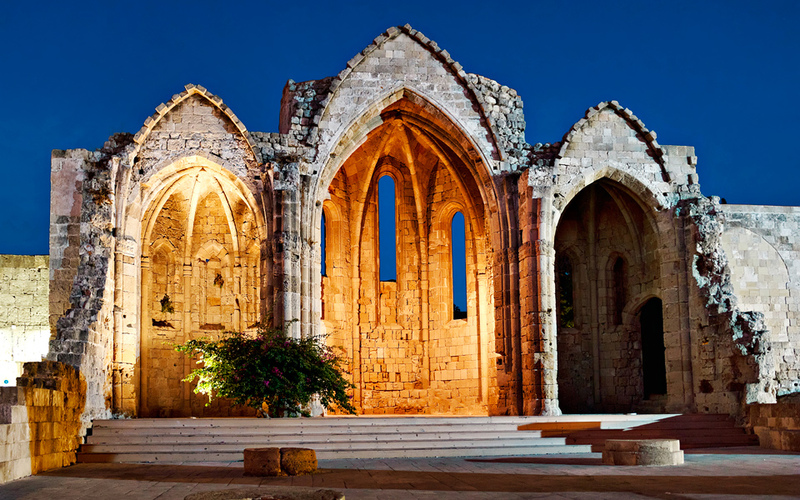 A special ticket of EUR 10 is also available which will get you into several sites, including the Archaeological Museum of Rhodes.